The book, ‘Geopolitik Pakistan’ is a major contribution on the Pakistani intellectual scene. This seminal endeavour on Geopolitiks from Pakistani perceptive is even more astounding. The book aims to introduce a critical subject with new thinking for the benefit of Pakistani nation and the world at large. Pakistan’s Weltanschauung or world view is indeed a pioneering Geopolitikal work of the author Brigadier Nadir Mir (R). His first book was ‘Gwadar on the Global Chessboard’ which was on Geo economics and greatly contributed to rekindle the Gwadar Project. Pakistan’s Weltanschauung or world view is the abiding theme rather than foreign imported concepts and ideas. Geopolitik, in this book is a combination of National Security Policy and Foreign Policy. It commences with an appraisal of Global Geopolitikal environment which is heading towards a Non Polar World rather than an imminent Multi Polar World. In essence, even as the western world’s dominance recedes no new hegemon would be globally dominant. 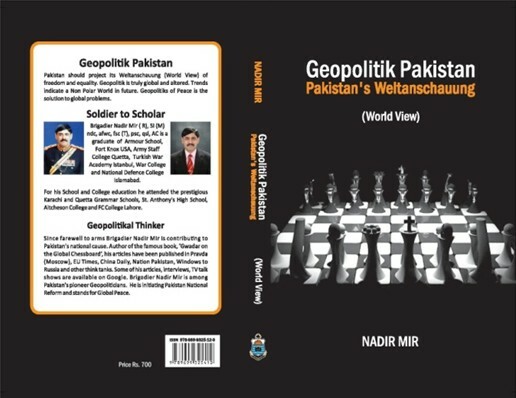 The critical importance of Geopolitiks for Pakistan and the subject’s evolution are discussed thread bare initially. The Geopolitiks relating to Afghanistan, Pakistan – India’s Geopolitikal rivalry and likely India – China Cold War are dealt at length and convincingly. Future Geopolitik 2013 – 2020 is an apt description of critical players in the global world. This is a fascinating Geopolitikal world tour. Aspects of Geo-Oceanic Politik and Geo-Demographic Politik, relationship of Politiks and Geopolitiks, Great Games and BRICS future are extremely well presented. The book contains 13 chapters, 283 pages and it is summed up in its Crux Chapter, to craft Geo-strategy and Geo-economics for Pakistan. The maps, sketches and illustrations make the book graphically comprehensive and illuminate the bigger world picture. Despite the Pakistani origin of this work, over all the global vision is perfectly apparent. ‘Geopolitks of Peace’ is the solution to the world’s problem. US – China amity is in global interest and Pakistan in fact proved a Geopolitikal bridge for initial US – China contacts. Russia has a great role to play for global peace and balance. Even as new powers Turkey, Brazil, South Africa are rising and contributing to the world’s prosperity. The same way, Turkey, Saudi Arabia, Iran, Russia and others have historical, cultural and multi links with Pakistan. This work portrays Pakistan’s potential both as a bridge state and an interposing state. ‘Geopolitik Pakistan’ is an effort to highlight Pakistan as a unified, powerful and prosperous rising power, its current troubles notwithstanding. Pakistan needs change and the change should be democratic, reform revolution based. The book is very well researched. A rare combination of history, geography, economics, strategy, ideology, emotions and a lot more to make it real Geopolitiks. It covers the historic past, deals with present day issues and projects the future pragmatically. This propagates Pakistan’s new National Security Narrative and Foreign Policy which projects Pakistan’s National Cause. While suggesting peace with India, Indian hegemony is to be resisted and Kashmir remains central to Pakistan’s Cause. All told, the book, ‘Geopolitik Pakistan’ is a surprise gift from this beleaguered nation. Any reader would be influenced by the historic truths, geographical realities, pragmatic deductions and logical yet suggestive narration. Certainly, a book of sound ideas and great authority for every chapter being virtually conclusive. The author, as a pioneering Geopolitician has contributed immensely to the National Cause of Pakistan and for global peace. He is initiating Pakistan National Reform. The author Brigadier Nadir Mir has written articles on Geopolitics, they have been published in Pravda ru (Moscow), China Daily (Beijing), EU Times, Windows to Russia, The Nation Pakistan and many think tanks.